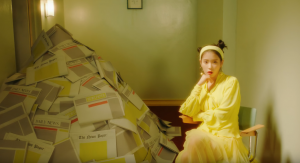 IU Hands Out Warnings with "BbiBbi"
On October 10th, IU marked the 10th anniversary of her debut with the soft R&B single, “Bbibbi.” The song achieved a “perfect all-kill,” and broke a record in most unique listeners in 24 hours on Melon. In addition to being an instant hit, the song is also causing a stir with its warning message to netizens. IU has sent out messages to online haters before. In “Twenty-Three” she calls out their hypocrisy and brushes off insults. Then in “Palette,” she states she knows she’s still hated and being judged but is fine with it. Now with “Bbibbi,” she cautions haters not to cross any line with her with their comments. The warning may not just be for show, last year LOEN Entertainment successfully sued and won cases against malicious commenters on her behalf. Using the term “yellow card,” which is used as warnings in sports to call out a violation, IU metaphorically hands out yellow cards to netizens who are close to crossing a line with her. While she sings every word gently and the song carries a simple and soft beat, her words are direct and take stabs right back at them. In the chorus, she greets them with “Hello stup I D” in which ID references a username but also cleverly hints at the word “stupid” insulting the person behind the ID. Additionally, when she asks what her score is for the day she quickly follows the line with “jealous jealous” suggesting her gossipers are envious of her. The MV is as misleadingly cute as the song with its pastel-colored scheme and retro concept. When looking at the details, we see IU’s message is being symbolically displayed in the MV. IU is seen sitting next to and sometimes on a pile of newspapers. The newspapers easily symbolize all the news articles written about her during scandals, and as she casually throws one into the pile, we see she’s unfazed. She’s also surrounded by dial-phones in another scene seemingly bombarded with gossipers. However, she politely states she has no interest in hearing their words. There are other scenes that also reference IU’s toxic relationship with the media and social commenters. In one image, she’s nonchalantly standing in front of a target with darts flying showing they narrowly missed her. It’s clear she knows as a celebrity she’s out there in the open and the darts symbolize the comments being made about her that are getting close to hurting her. However, she still stands there, unafraid. While the color scheme is mostly pastels, yellow plays an important role in the MV. IU wears several all-yellow outfits, and there are splashes of yellow in the background. She’s also shown on a sport’s field painting yellow lines. The color goes with the main line of the chorus in which she mentions the “yellow card” tying her warning into all the other elements in the MV. The yellow lines she draws metaphorically shows neitizens how far they can take their negative comments with her. 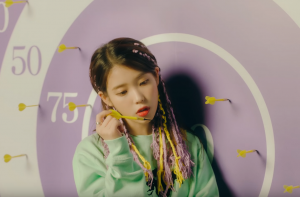 The alt-R&B track may look and sound soft in delivery, but IU fights back at haters by subtly insulting them and admonishes them for their assumptions about her. She keeps a calm and unconcern facial expression throughout the MV, but we see that IU isn’t as submissive as she may appear to be. She may not be roaring with anger or crying hysterically but IU gets her message across showing that she’s not going to take the insults lying down. 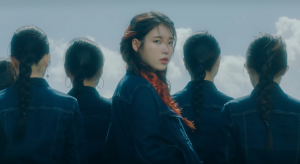 “Bbibbi” showcases IU’s maturity and talent as a songwriter throughout her 10-year career. The song is rich in personal words that depict IU’s thoughts on the opinions of anti-fans and scandals. Oftentimes, the lyrics in other popular K-pop songs tend to be generic and appeals to its fanbase by creating a romantic fantasy that fans can inject themselves into. However, with IU, she’s not afraid to speak out against her followers despite that it may isolate them from her. She also doesn’t miss the chance to share an experience that is uniquely hers. In doing so, we get a glimpse into IU’s struggles and opinions. “Bbibbi is beautiful and subtle in execution, and truly deserves all the success it has already achieved.